[174 Pages Report] The global food certification market was valued at USD 8.45 Billion in 2017. It is projected to reach USD 11.45 Billion by 2023, at a CAGR of 5.2% from 2018. Food certification helps in gaining consumer trust regarding food safety and quality. Certification standards address compliance to food safety and quality parameters of food, packaging, packaging materials, and storage & distribution for primary producers, manufacturers, and distributors. 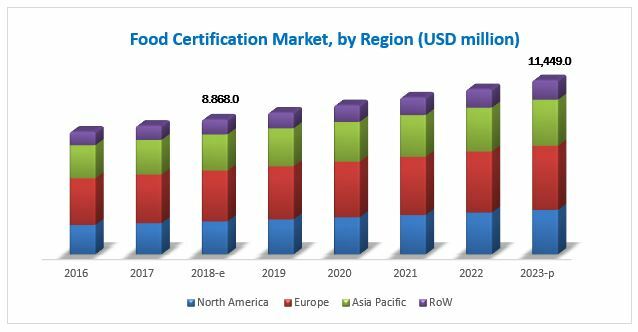 Factors such as increasing consumer awareness about certified food products, growing demand for processed meat products certification, and rising prevalence of foodborne illness are expected to drive the growth of the global food certification market during the forecast period. Market players are responding to new opportunities by expanding their global presence and gaining accreditations by government bodies. To forecast the size of the market and its various submarkets with respect to four main regions, namely, North America, Asia Pacific, Europe, and Rest of the World. This report includes estimations of the food certification market size in terms of value (USD million). Both top-down and bottom-up approaches have been used to estimate and validate the size of the market and to estimate the size of various other dependent submarkets in the overall market. Key players in the market have been identified through secondary research through various sources-such as research & development (R&D) institutions, the Food and Drug Administration (FDA), the European Food Safety Authority (EFSA), the US Department of Agriculture (USDA), the Food Standard Agency (FSA), the Food Safety and Standards Authority of India (FSSAI), and government agencies-and their market ranking in the respective regions have been determined through primary and secondary research. All percentage shares, splits, and breakdowns were determined using secondary sources and verified through primary sources. The food certification ecosystem comprises food certification providers such as DEKRA SE (Germany), DNV GL (Norway), Intertek Group Plc (UK), SGS SA (Switzerland), TÜV SÜD (Germany), Lloyd’s Register (UK), Eurofins Scientific (Luxembourg), Kiwa Sverige (Sweden), ALS Limited (Australia), and UL LLC (US). To know about the assumptions considered for this research report, download the pdf brochure. The study answers several questions for stakeholders, primarily which market segments to focus on in the next two to five years for prioritizing efforts and investments. This research report categorizes the food certification market based on type, application, risk category, and region. Segmental analysis, which provides a further breakdown of risk category such as high-risk foods and low-risk foods. Further breakdown of the Rest of the Asia Pacific market for food certification, by countries. The global food certification market has grown remarkably in the last few years. The food certification market is estimated to be valued at USD 8.87 Billion in 2018, and is projected to reach USD 11.45 Billion by 2023, at a CAGR of 5.2% from 2018. Emerging economies such as India, China, and Brazil are the potential primary markets of the industry. Growing international trade, coupled with increasing food safety regulations, has been fueling the demand for food certifications. Rising prevalence of foodborne illness is expected to drive the growth of the food certification market during the review period. Growing consumer awareness about certified food products has significantly increased the demand for food certification. This has led to the voluntary adoption of certification programs by food manufacturers to gain consumer trust. Another important factor that drives the growth of the food certification market is the increasing demand for processed meat products certification. The food certification market, based on type, is segmented into ISO 22000, BRC, SQF, IFS, halal, kosher, free-from certification, and others such as FSSC 22000, ISTA, other GFSI certifications. 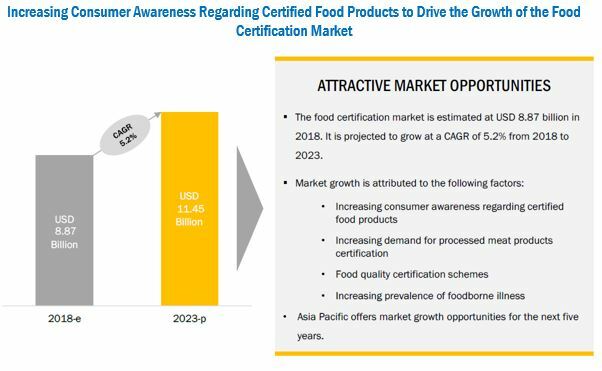 The free-from certifications segment is projected to grow at the highest CAGR among all food certification types from 2018 to 2023. Regulatory bodies in various countries are asserting that food producers have appropriate allergen or gluten free labeling on their products, owing to the growing concerns among consumers about food allergies; this is expected to drive the demand for free-from certification during the forecast period. Based on application, the food certification market is segmented into meat, poultry, and seafood products, dairy products, infant food, beverages, bakery & confectionery products, free-from foods, and others. The meat, poultry, and seafood products segment is projected to lead the food certification market during the forecast period. A certification system is required for the entire value chain of meat, poultry, and seafood products-from processors to importers, exporters, and distributors. Increasing meat product recalls across several countries are fueling the demand for food certifications for meat, poultry, and seafood products. Based on risk category, the food certification market is segmented into high-risk foods and low-risk foods. The high-risk foods segment is projected to grow at a relatively higher CAGR from 2018 to 2023 as these foods are more prone to bacterial contamination due to high moisture and protein content, and therefore stringent quality standards are maintained while manufacturing, storing, and transporting these products. The North American region is projected to grow at the highest CAGR during the forecast period. The food certification market is mainly driven by the strong food safety regulations imposed by the governments across the North American countries for imported goods. The US accounted for the largest country-wise market for food certification in the North American region, and is majorly driven by the factors such as initiatives taken by the US government pertaining to certification and accreditation services and promotion of food certifications such as Safe Food Quality (SQF), GlobalGAP, and British Retail Consortium (BRC). However, lack of awareness about food certifications among small-scale manufactures and increase in incidences of false labeling and certifications are the major challenges for the global food certification market. Expansions, new service launches, acquisitions, accreditations, and partnerships are the key strategies adopted by players to ensure their growth in the food certification market. Major players in the market include DEKRA SE (Germany), DNV GL (Norway), Intertek Group Plc (UK), SGS SA (Switzerland), TÜV SÜD (Germany), Lloyd’s Register (UK), Eurofins Scientific (Luxembourg), Kiwa Sverige (Sweden), ALS Limited (Australia), and UL LLC (US).